Pack a picnic dinner and a chair as you're invite to listen to Aboriginal astronomy stories weave their magic as the sounds of opera and local musicians drift across the wheatfields. Join us for some springtime stargazing and a journey across the dark night sky over historic Macpherson Homestead in Carnamah... you'll discover why WA has some of the best stargazing in the world! See Saturn, Jupiter and much more through telescopes. Follow a laser-pointed tour of the night sky that will reveal an amazing world of beauty and wonder on a night to remember. Carol Redford "Galaxy Girl" from Astrotourism WA will join us to celebrate and launch the North Midlands Stargazing Group at its new home, the Macpherson Homestead. Bring along your own telescope if you have one! The evening starts at 6pm and finishes at 9pm. There is no cost to attend this event. Please contact Jess on 0418 219 508 to let us know you are coming. There will also be gourmet roasted saltbush fed lamb of Darling Creek Lamb with fresh slaw and condiments roll or gourmet roasted vegie wraps with seasonal salad and condiments and soft drinks available on the evening. 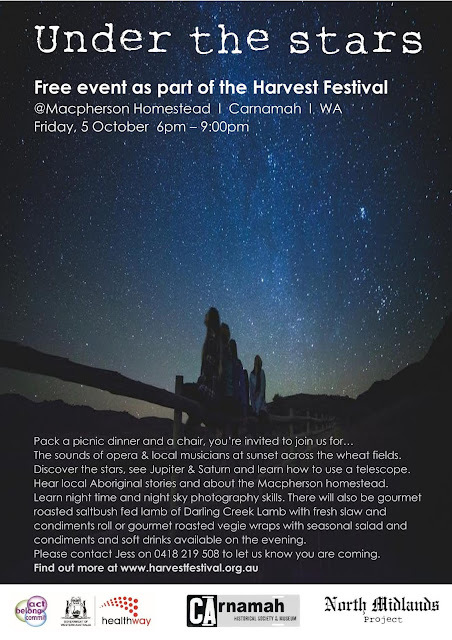 This event is made possible by the Shire of Carnamah and is part of the Astrotourism WA project that’s promoting Carnamah as a destination for stargazing and astrophotography.